The Hall Art Foundation is pleased to announce a group exhibition curated by American artist Eric Fischl to be held in its galleries in Reading, Vermont. Approximately sixty-five artists are represented in Hope and Hazard: A Comedy of Eros, which includes over eighty paintings, photographs, works on paper and sculptures selected by Fischl from the Hall and Hall Art Foundation collections. In this fresh and provocative show, Fischl illustrates the absurd extremes associated with romantic and sexual love. Desire, passion, vulnerability, disappointment, pleasure and torment are expressed as a Greek or Shakespearian comedy – epic and tragic, hopeful and hazardous. 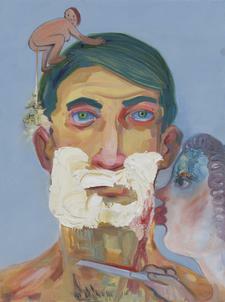 In Little Shaver (2005), Nicole Eisenman paints a straight-on portrait of a male whose face is being shaved with a straight razor. The female barber kisses the man’s shaving cream-covered cheek while slicing his neck with the blade. Atop the man’s head squats another small female figure, urinating onto the tip of his ear. Amid this scene that is at once tender, violent and absurd, the man maintains a deadpan, forward gaze. The extremes associated with eros can also be perceived in the sculpted form. 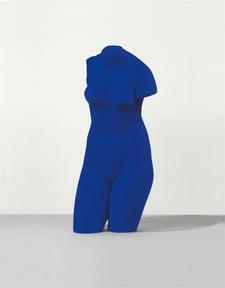 While Yves Klein’s deep blue sculpture of a female torso represents an idealization of the human body, A.R. 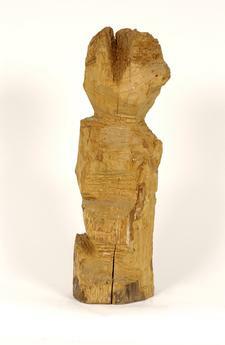 Penck’s phallic and roughly hewn wood sculpture, Untitled (1983), is imbued with a certain violence and existential isolation. The melodrama often associated with love and romance can be seen in Walter Robinson’s Suburban Affair (1979), where a man embraces a woman reclined on a sofa. In a moment of pulp fiction passion, the strap of the woman’s dress falls from her shoulder, her red dress rises above her knees, and her cocktail glass is tipped over in her hand. 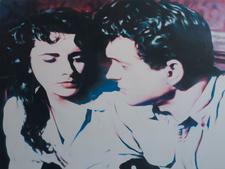 Painted from a film still featuring Elizabeth Taylor and Rock Hudson, Judith Eisler’s Liz & Rock (2014) also depicts a moment of romantic tension between two glamorous movie stars, sexual icons of their time. 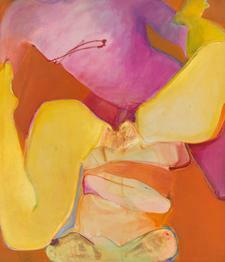 In C. Smith (1972), John Kacere’s curvy and fleshy painting of a woman’s buttocks illustrates an unselfconscious and uncomplicated eroticism. On the other hand, the serpentine entanglement of the figures in Peter Eide’s Untitled (Blanket of Stars) (2015) alludes to the multi-faceted complications that can also be present in sexual and romantic partnerships. Hope and Hazard: A Comedy of Eros includes works by Siegfried Anzinger, Alexander Archipenko, Robert Arneson, Dan Attoe, Georg Baselitz, Lillian Bassman, Ellen Berkenblit, Katherine Bernhardt, Norbert Bisky, Josef Breitenbach, André Butzer, William Copley, John De Andrea, Carroll Dunham, Marcel Dzama, Peter Eide, Nicole Eisenman, Judith Eisler, Tracey Emin, Lee Friedlander, Dan Gluibizzi, Bendix Harms, Georg Herold, Jocelyn Hobbie, Thomas Houseago, Ridley Howard, Chantal Joffe, John Kacere, Craig Kauffman, Yves Klein, Jeff Koons, David Levinthal, Judith Linhares, Tala Madani, Robert Mapplethorpe, Tony Matelli, Jonathan Meese, Bjarne Melgaard, Gladys Nilsson, Jim Nutt, Julian Opie, C.O. Paeffgen, A.R. Penck, Enoc Perez, Alessandro Pessoli, Erwin Pfrang, Francis Picabia, Nathaniel Mary Quinn, Mel Ramos, Man Ray, Bettina Rheims, Jason Rhoades, Walter Robinson, Aura Rosenberg, David Salle, Peter Saul, Ryan Schneider, Lara Schnitger, Pieter Schoolwerth, Joan Semmel, David Smith, Luc Tuymans, Tom Wesselmann, Hannah Wilke, Erwin Wurm and Lisa Yuskavage. Born in New York City in 1948, Eric Fischl is one of the most influential American figurative painters and sculptors working today. After growing up in the suburbs of Long Island, he earned his B.F.A. from the California Institute for the Arts in 1972, and subsequently taught at the Nova Scotia College of Art and Design in Halifax between 1974 and 1978. Fischl is most well known for provocative, large-scale paintings of middle-class suburban America that are imbued with psychological and often uncomfortable sexual undertones. His paintings, sculptures, drawings and prints have been the subject of numerous solo and major group exhibitions. His work is represented in many prominent institutional collections worldwide, as well as prestigious private and corporate collections, including the Metropolitan Museum of Art, New York; the Whitney Museum of American Art, New York; the Museum of Modem Art, New York; the Museum of Contemporary Art, Los Angeles; the St. Louis Art Museum, St. Louis; and the Louisiana Museum of Art, Denmark, amongst many others. In 2011, Fischl organized America: Now and Here, a multi-disciplinary exhibition of the United State’s most celebrated visual artists, musicians, poets, playwrights, and filmmakers designed to spark a national conversation about American identity through the arts. The project launched in Kansas City before traveling to Detroit and Chicago. Fischl is a Fellow at both the American Academy of Arts and Letters and the American Academy of Arts and Sciences. He lives and works in Sag Harbor, NY with his wife, the painter April Gornik. This exhibition contains sexually explicit content and may not be suitable for all audiences, including minors. Viewer discretion is advised.